How is Straight Tomoe Mangekyō Sharingan awakened? How is it superior to normal Mangekyō Sharingan? In Naruto Shippuden, Madara tells Sasuke that he's so powerful because he could awaken a Straight Tomoe (Choku Tomoe) Mangekyō Sharingan. I wonder what is the difference between a Mangekyō Sharingan and a Straight Tomoe Mangekyō Sharingan and how is it more powerful than normal one? The Choku-tomoe Mangekyō Sharingan is the completed transformation of the Mangekyō Sharingan, also known as Eternal Mangekyō Sharingan. Sasuke and Madara are the only known wielders that have achieved it throughout the series. Transplant the eyes of the clan member to the user. In Madara's and Sasuke's case, they acquired the eyes from their brother, and both of them and their brothers already have Mangekyō Sharingan awakened. It's not sure that whether both donator and donor has to have Mangekyō Sharingan awakened in the first place in order to activate the Eternal Mangekyō Sharingan after the transplant. Although, it is not guaranteed to give everyone regained eyesight and ocular powers. It will usually regain the user eyesight. The straight tomoe of the Eternal Mangekyō Sharingan grants the user fluidity in the movements when fighting. It is suggested that the eyes can support non-Mangekyō ocular powers such as Izanagi and Izanami, when Sasuke asked his brother how they would use Izanagi to defeat Kabuto. You can find more abilities about the Eternal Mangekyō Sharingan here. Itachi was almost blind during his fight against Sasuke. Sasuke was nearly blind after the fight against Danzo. Madara said that he was pretty much blind when he transplanted his brother's eyes. The Straight Tomoe Mangekyou Sharingan is a Mangekyou Sharingan that won't gradually lose its eyesight like a normal Mangekyou Sharingan. Thus, it is also known as the Eternal Mangekyou Sharingan. This is the biggest difference between the two. Another difference between the two is that an Eternal Mangekyou Sharingan (henceforth EMS) is awakened by transplanting another's Sharingan. Throughout the canon (the manga) only Uchiha Madara and Uchiha Sasuke has achieved this. Both transplanted their brother's eye and both them and their brothers has already achieved Mangekyou Sharingan (MS) when the transplantation was done. An MS is awakened by watching the death of someone dear, which in Itachi's case was the death of his best friend, Uchiha Shisui. In Sasuke's case is the death of Itachi. 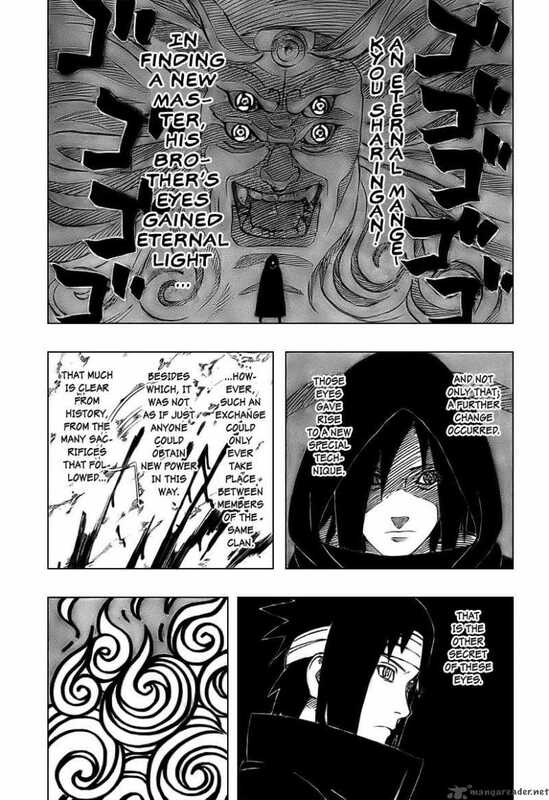 If I recall correctly Madara awakened his MS after the death of one of his brothers. An EMS is not more powerful than an MS in term of power. It also doesn't unlock more occular jutsu. Upon acquiring EMS, Sasuke's Amaterasu didn't get any stronger. EMS only restores an MS' eyesight and removing its drawback of getting blind, which is why it is called Eternal. An Eternal Mangekyo Sharingan uses less chakra. That's why it's more powerful because it can be used for a longer period than the Mangekyo Sharingan with the same level of chakra. Madara states that their bond may go deeper than blood, meaning he is aware of the possibility that Sasuke is his modern day reincarnate. He noticed that Sasuke has an Eternal Magenkyou Sharingan, something that Madara knew only he had accomplished. Is the Eternal Magenkyou Sharingan stronger? Yes. Very much so. Considering that with a regular Magenkyou Sharingan you can’t overuse the abilities before losing sight, falling ill, or wasting chakra, you cannot truly master or learn any of these abilities. Such as the perfect Suasnoo, the flame control techniques used in unison with Susanoo, and many other examples that have to do with MS specific abilities. The other strength behind EMS is it allows the user to have even better eyesight, and also allows for them to see in the dark as stated by Sasuke. Only Madara and Sasuke have truly accessed all of the fully developed versions of the base MS abilities because of their extended usage of their EMS. Do the Sharingan dots decide their power/ family tree? How can Itachi use his Mangekyō Sharingan after death?